Mouse Phenotyping Services at the University of California, San Diego offers guidelines and some services, in order to proceed with a comprehensive investigation of genetically altered mice. 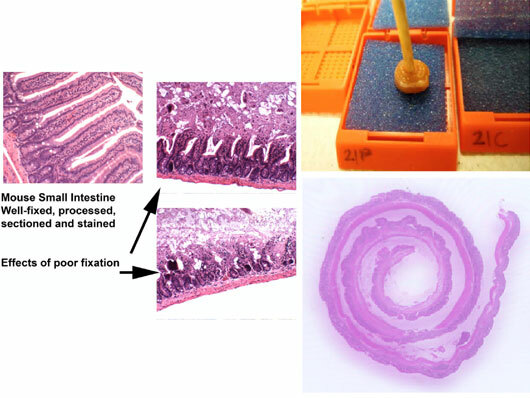 Click on "Histopathology" above, to view additional helpful links, and to review hints on questions like "How do I proceed to get histopathological evaluation done on these harvested mouse organs?". The Protocols section is being updated constantly, and provides helpful protocols for commonly used histological methods. A phenotypic evaluation of animal models of human disease is critical in the understanding of the pathogenesis and the processes involved. A careful examination (always with the organs and tissues from littermate controls) of completely back-crossed genetically altered mice, at different ages, is required . A comprehensive histopathologic review, hematology analyses, chemistry panels and a variety of behavioral tests will help to accomplish some of these goals. A comprehensive study should plan to first look for systemic changes by doing basic screens with hematology and chemistry assays in serum. The Hematology/Chemistry section of the Mouse phenotyping core will get that organized. Then, if there are changes seen, we would plan a terminal experiment, with drawing more blood for coagulation assays and the organs would be fixed for histologic analysis. The usual ones that are screened by histology for this purpose, would include about 30 tissues. The mouse phenotyping core does offer all those services, on a Recharge basis, but you would have to do a large number of animals—we recommend that we should plan to examine serum from about 32 animals and tissues from 24 animals. This would include 6 male and 6 female littermate controls, and then 6 male and 6 female test animals, as a minimal first run screen. The whole evaluation usually takes about 6-12 weeks, with reports, photographs etc. Our experience with mouse pathology, looking at littermate controls and gene altered mice models of human disease, over the last 15 years has allowed to recommend that protocol. To familiarize students and postdoctoral fellows with the procedures and protocols, classes are offered annually in the Fall Quarter MED 234, that outline practical methods that are used in phenotyping genetically altered mice. Correct processing of tissues, is critical such that the histopathologic changes within mutant animals, are interpreted accurately. Anatomy, Histology, Histopathology, Histochemistry and Immunohistochemistry methods are introduced, and also the methods used in Hematology and Chemistry assays, during these classes. A second series of elective lectures occur in the Spring quarter, where specific animal models are discussed PATH 225. Undergraduate students may also train (two years) towards obtaining American Society of Clinical Pathology board certification in histotechnology. When tissues are removed from the body, during surgery, or during an autopsy, prompt onset of autolysis occurs which can inhibit efforts to isolate nucleotides or certain enzymes and proteins for various investigative efforts. 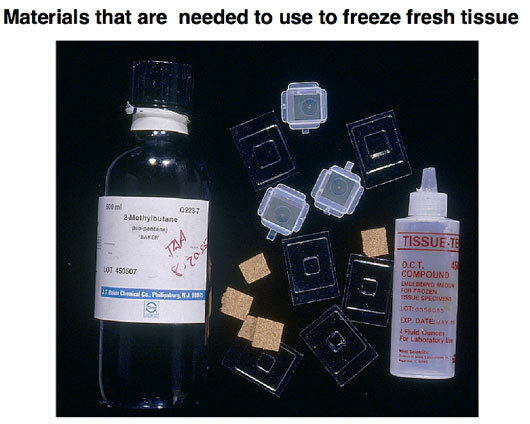 The tissue thus has to be flash-frozen for extracts, or frozen in cryoprotective agents, or fixed, using different procedure-dependent fixatives, for analysis in histo-pathology as shown in Figure 1. Optimum Cutting Temperature Compound (OCT) is the commonly used cryoprotective agent to surround tissues prior to flash- freezing. If tissues are placed into the freezer without using cryoprotective agents, the water molecules freeze at different rates from the freezing of the tissue. When one then attempts to make frozen sections for use in histology or immunohistochemistry, the tissue will look “broken” and shattered with spaces where antibodies will congeal contributing to non-specific background. 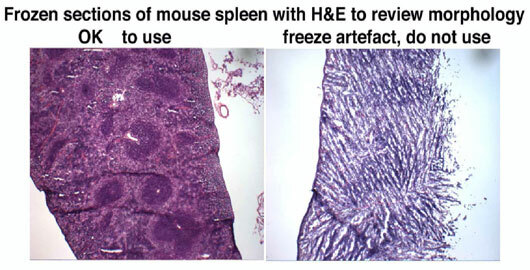 Figure 2 demonstrates the poor morphology of a poorly frozen mouse spleen, stained using hematoxylin and eosin. 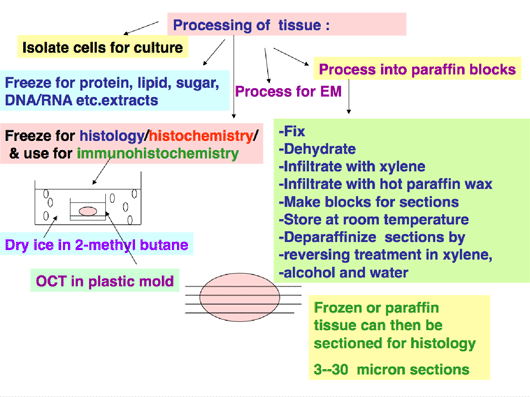 Figure 3 shows the materials that are needed for freezing tissue. The tissue is harvested, blotted to remove tissue fluids, surrounded and immersed in freezing medium and flash frozen, either in liquid nitrogen or in a dry-ice/2-methyl butane slurry, and then stored at minus 80 until needed for frozen sections. 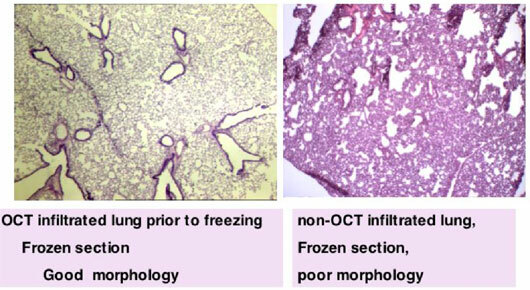 For the best morphological analyses it is best to inflate the lungs with fixative or with the freezing medium. Although human lungs are large in comparison to mouse lungs, if they are inflated with fixative, it is possible to analyze morphologic detail optimally. Since mouse lungs collapse when the thorax is opened it is important that, after identifying the cartilage-ringed trachea, the lungs are inflated in order to obtain the best histological detail. 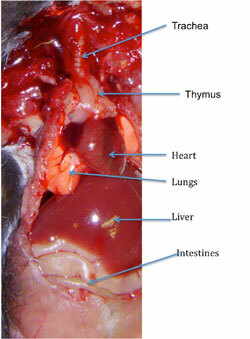 Figure 4 demonstrates an open thorax of the mouse with the trachea, thymus, heart and lungs in the thorax with a partially opened abdominal cavity showing the liver and some of the intestines. Figure 5 then shows the difference between un-inflated lungs on the left, in contrast to the image on the right, which shows inflated lungs, which are almost enclosing and surrounding the heart and pressing down on the diaphragm. 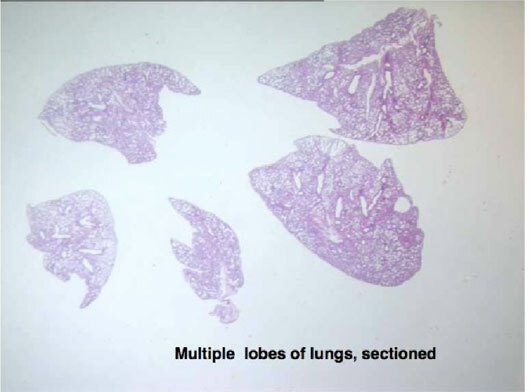 Figure 6 then demonstrates stained sections of the mouse lungs after each lobe has been separated and embedded before sectioning and staining, in order to identify small changes in morphology. If the mouse lungs are to be used as frozen sections it becomes even more important to inflate the lungs with a 1:1 mixture of freezing medium in buffer, before freezing for long term storage. 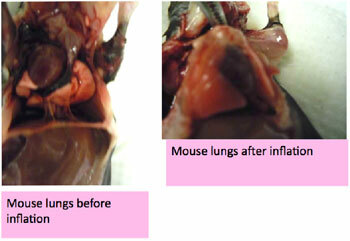 Figure 7 demonstrates on the left panel, the good morphology of mouse lungs frozen after inflation and the on the right, the poor morphology on sections from mouse lungs that were not inflated. Specific requirements for Skin, Spleen, Thymus, Pancreas, Adipose tissue to obtain optimal morphology. These particular organs need to be flattened between histology sponges into cassettes, before fixing, in order to obtain the best sections for staining analyses. This flattening before fixation allows these tissues to be oriented, such that the entire section will show large areas for analysis. The plastic cassettes that are used for fixing should be labeled with an indelible marker, Do not use a “Sharpie”, which is soluble in the organic solvents which are used for processing. 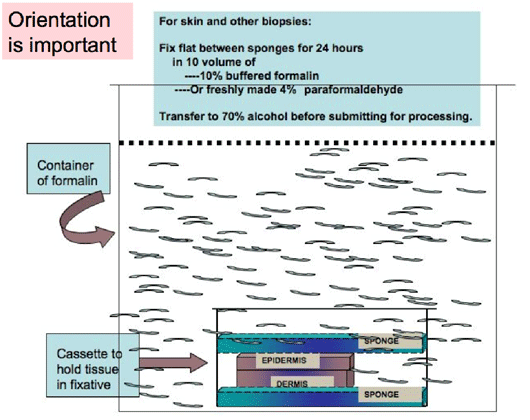 Similarly if skin is flattened before fixing the histotechnician will correctly orient while embedding it into paraffin wax, after processing. Like most organs, tumors are also three dimensional, and so it is best to make thin slices, before fixing flat in correctly simply labeled cassettes, for fixing. The intestinal mucosa is extremely sensitive to prolonged periods of drying and thus must be fixed with as much haste as possible. Small segments are opened and rolled onto a stick, before immersion fixation, for processing, embedding, sectioning and staining. 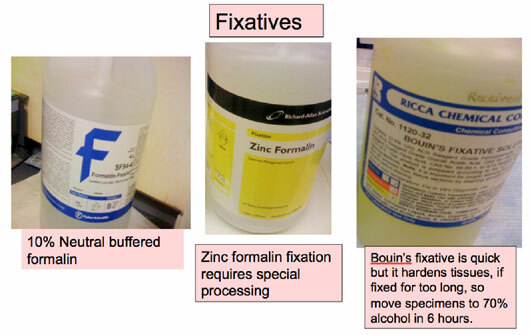 The commonly used fixatives are shown in Figure 13. However, freshly made 4% paraformaldehyde is preferred for small samples and also fixes well. Tissues should be fixed for less than 24 hours, before being processed and embedded into paraffin for sectioning and staining. 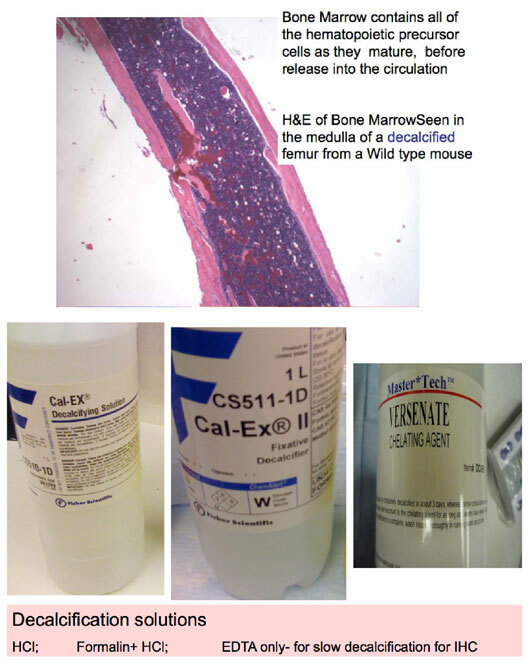 Decalcification of Bones using one of various reagents is important before processing and embedding into paraffin blocks for sectioning and staining. Using EDTA for decalcification, takes longer but is advantageous in allowing the detection of antigens in immunohistochemistry assays.